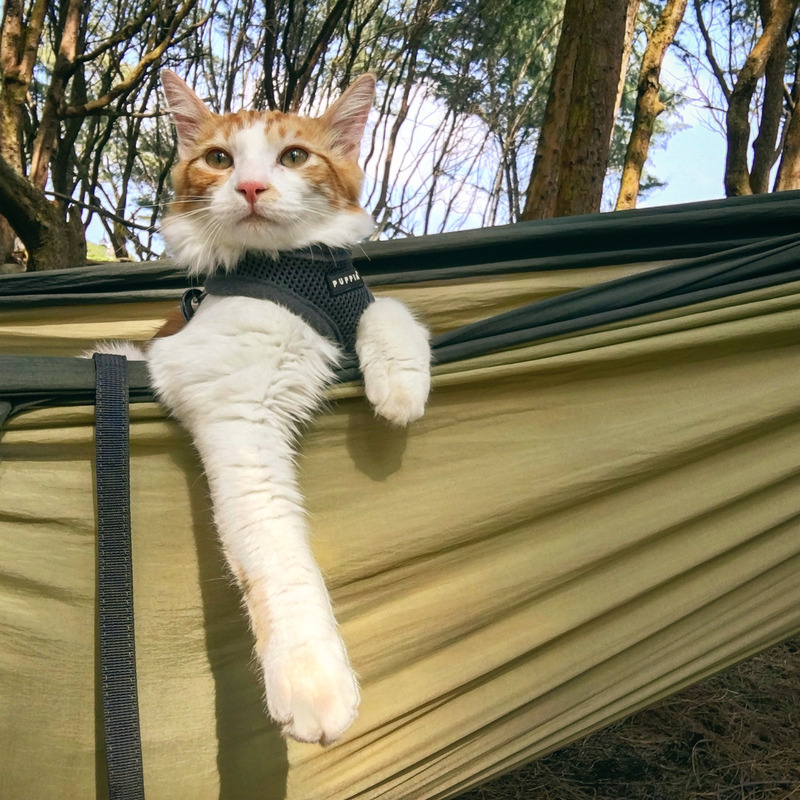 Training an adventure cat can be a bit of work, especially if your cat is wary of the process. But Samantha Christie’s rescue cat Atlas was all about it. 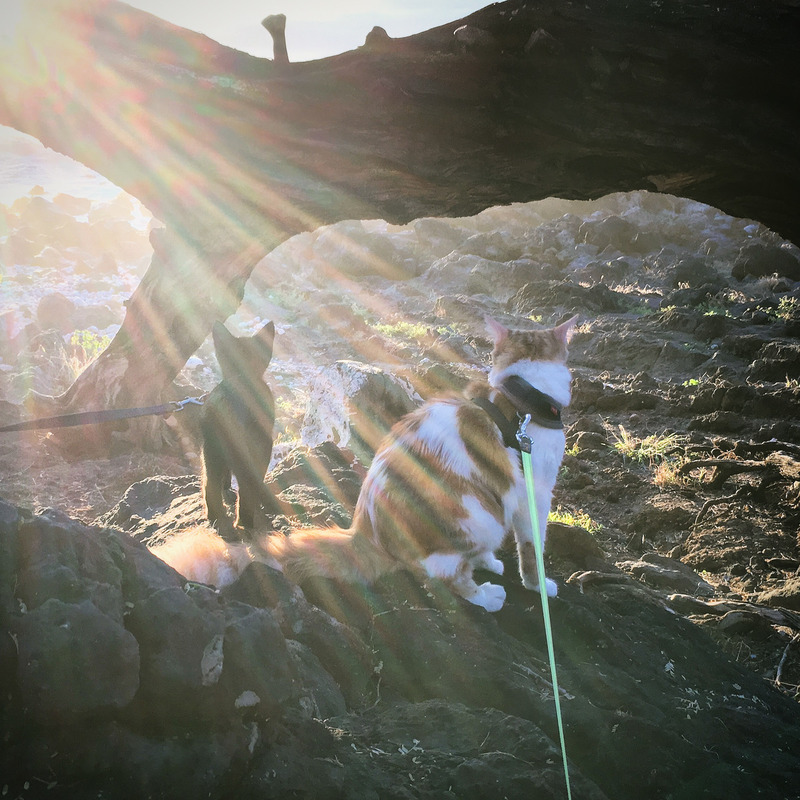 In fact, he loved it so much he’s led other cats in adventures, and now Christie hopes Atlas will inspire more people to leash train their cats. 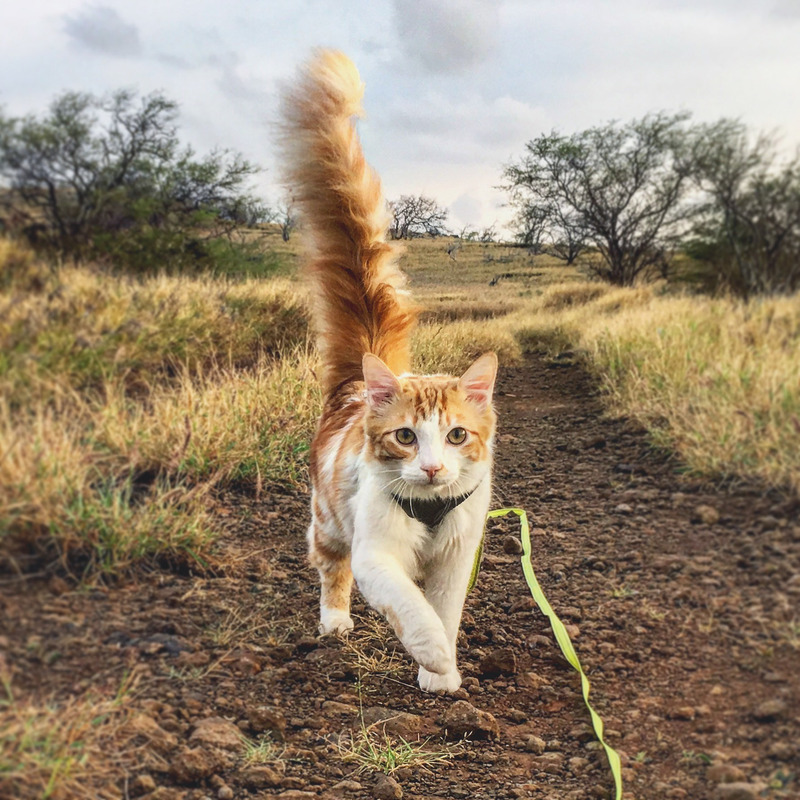 Christie rescued Atlas from the Hawaii Island Humane Society about a month after she moved to Hawaii from Delaware. Christie already had two cats, but she had to leave them behind for 120 days while they underwent the state’s mandatory rabies quarantine. Lonely, and a bit inspired by Adventure Cats, Christie decided to seek out an adventure cat of her own. Atlas, a medium-haired tabby, had been surrendered along with his mom and sister at 3 weeks old. When Christie brought him home at 8 weeks, she was pleased to find she had a very outgoing and adventurous kitten. 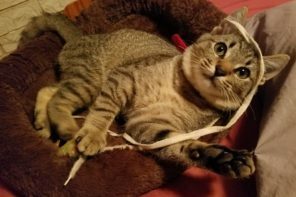 Thanks to a caring staff at the Humane Society, Atlas had been socialized with both people and other cats, and he had boundless energy that could be quelled only by taking him outdoors. “Atlas was a very naughty kitten,” Christie told Adventure Cats. “A part of me wanted to give up on leash training because he was such a bad boy most of the time, but I stuck with him and I’m so glad I did. Atlas has proven to be a force of nature, but he always comes running when Christie picks up his harness. “He’s mellowed out now, but he is still a piece of work,” she said. 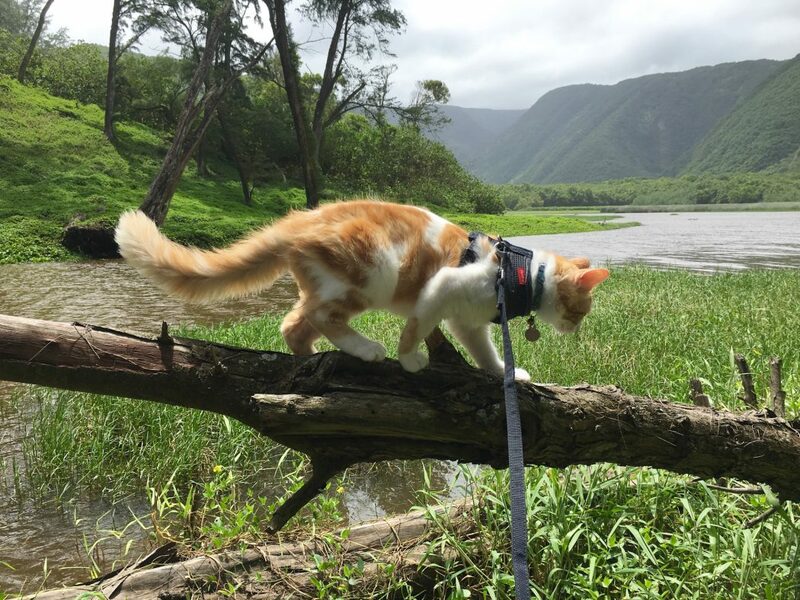 Over the past year, Atlas’ adventures have taken him all over the Big Island — from Pololu Valley, where they hike down to the black sand beach for bird watching in Christie’s hammock, to their favorite spot at the end of a nondescript road where they can hike along the coast at sunset. Atlas gets to stalk crabs and Christie says the whale watching is “phenomenal” in the winter. Atlas also loves to hike with Christie, even the challenging switchbacks of Pololu Valley. 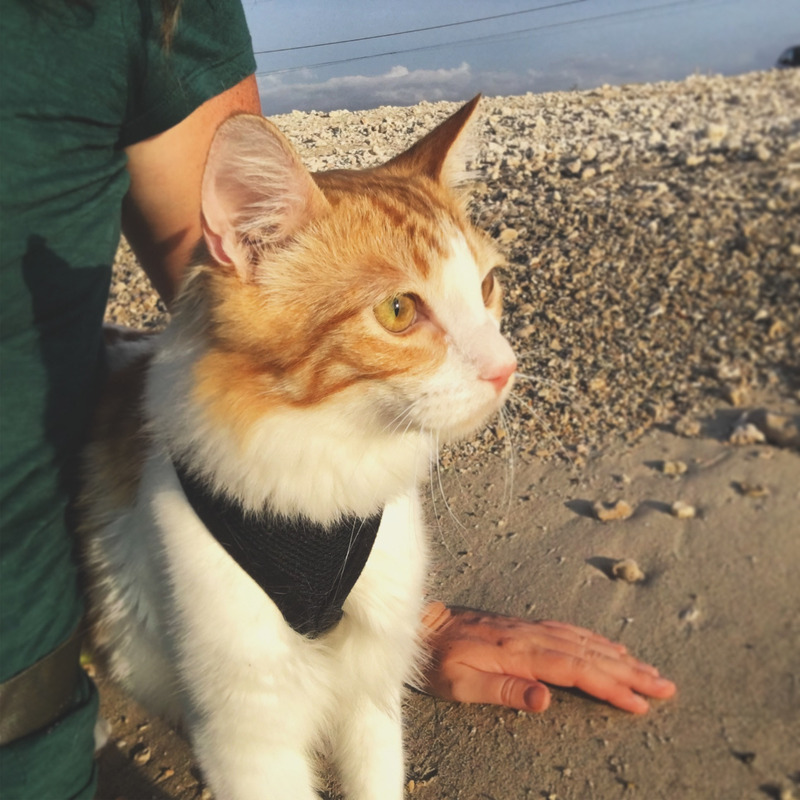 Christie adds that harness training can do more for “pawsome” felines like Atlas than simply provide stimulation and exercise. She says harness training provides a smart alternative to having an outdoor cat. 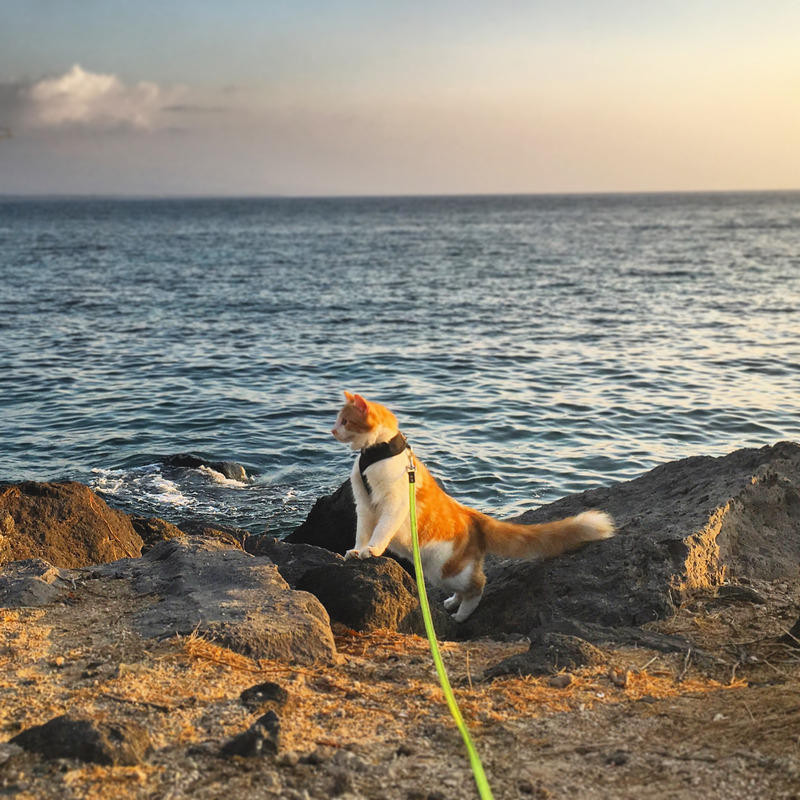 Christie believes by simply taking Atlas out on his harness that he can help educate people about the benefits of leash training and the dangers of leaving a cat to fend for itself outdoors. And it’s not just people the pair has educated. 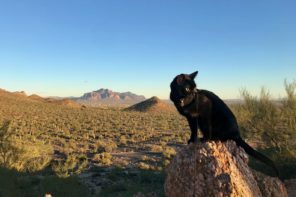 Atlas has adopted his own rescue cats and has even shared his love of adventuring. Atlas had other plans, though, yelling at the top of his lungs whenever Christie left the house. The sound attracted a stray. Of course, Darby isn’t Atlas’ only adoptee. A few months ago another stray kitten showed up. Thanks to Atlas’ friendly personality and love of adventuring, she and Atlas hit it off. The kitten, Nell, was eventually adopted by one of Christie’s friends. “In the future, we’ll foster more kittens so that Atlas can continue teaching the next generation of adventure kittens,” Christie said. Atlas’ next big adventure will be moving to Idaho in the fall when Christie relocates again. But first, Christie says she wants to take Atlas camping at Volcanoes National Park. Once in Idaho they’ll have their pick of national parks to visit. Scroll through the gallery at the top to see more photos of Atlas, and keep up with all of his adventures on Instagram.